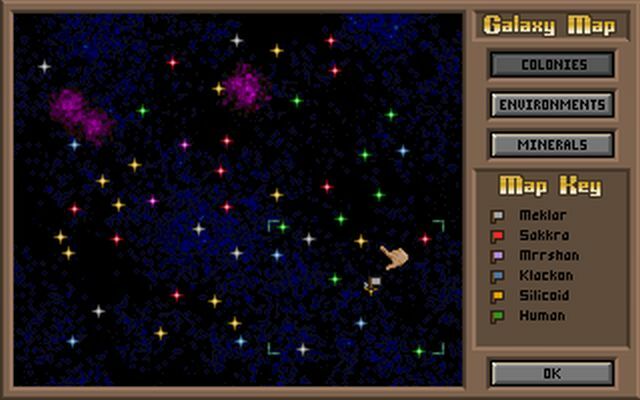 I started in the southeast corner of the map with two stars in range, a green and a blue. Since the odds were significantly better of having a habitable planet at the green star, I sent the colony ship there while sending a scout to the blue one. The other scout went to the yellow star that the cursor is pointing to above. LOT of dead space around Meklon to the east and west, which could prove to be good or bad depending on how the map shakes out. Now for some yellow star analysis. From the locations on this map, there will likely be one AI at the two yellows in the extreme north, two AIs in the cluster of yellows in the west, and another AI in the yellows to the south edge of the map. However, that still leaves one more AI race, meaning that the odds are very good that one of the two yellows near me will have an AI starting there. If it's the one just to the north, things will heat up VERY fast. Hopefully it will be the other one to the northwest, but we'll just have to wait and see. 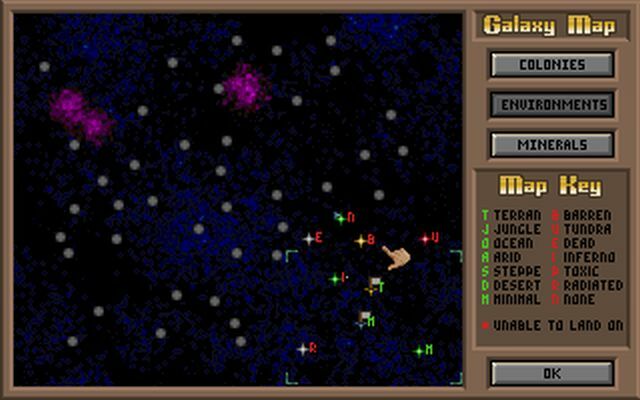 Klackons, located at the yellow star where the cursor is pointing above. Hmmm... not the best race to be starting next to! If the Klackons pull their typical expand like the plague strategy and cut me off in the corner, I could be in serious trouble here. 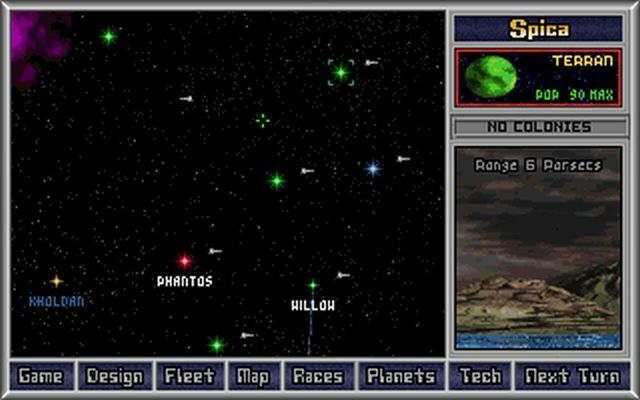 Of course, if you DO get shortchanged on planets, the Meklar aren't a bad race to have - but I'd prefer to avoid that if possible. Unfortunately, with this neighborhood I may not have an option! Outside of my two starting planets, six of the seven worlds around me are hostile. Even worse, the sole habitable planet is in the absolute corner of the map; everything coreward is staring at me in red text. And... this is as far as my scouts can go with their current range. About the only thing I can do at this point is hope that Controlled Barren is in the tree, so that I can settle that world and then MAYBE get some more worlds to the north before the Klackons do. Of course, I still have no clue what's up there at this point, so that may be a forelorn hope. Oh, AND that Barren planet is 4 parsecs away, so I'll need extended range to get there too. NOT looking good at this point, kiddies. I've got to find some way to break out of this corner, and fast! I decided to call this game "Meklar Corner" at this point, due to the start I drew. I just hope it ends better than Sirian's game of the same title! First things first though; I have to stand up Meklon and get a decent amount of factories built before starting research. Now I debated when I should turn on research, but ultimately I decided to aim for the usual target of approximately 200 factories on the home planet (the Meklar can go higher, of course) before starting. 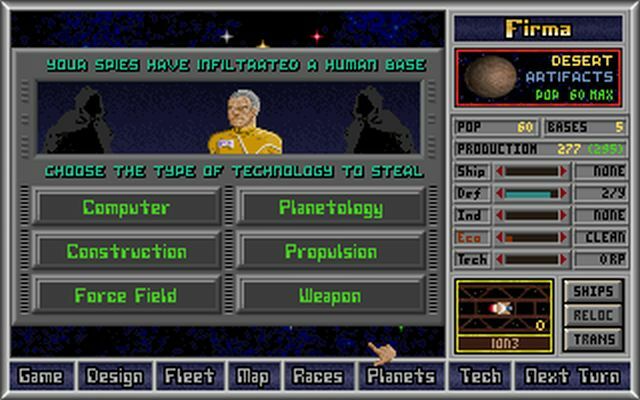 It just seems to me that maxing the home planet ASAP is the strongest opening move in virtually every situation; every one of the Realms Beyond succession games where that pattern wasn't followed seemed to end up with suboptimal results. Obviously you have to let the situation dictate your moves, but it seemed to me that it was better to get my research up into the 200+ RPs first! When I finally open the tech fields, it turns out that Controlled Barren is available. Yay! 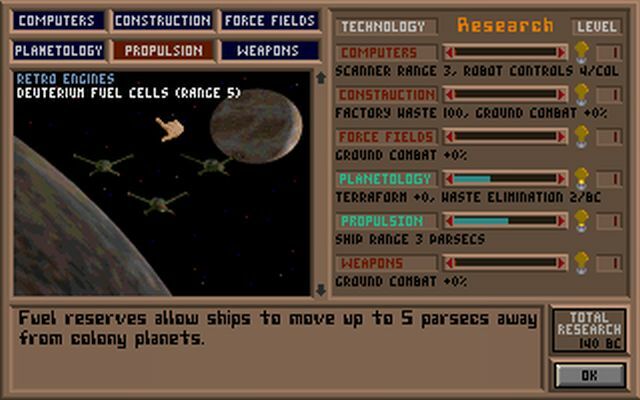 When Controlled Barren came into the percentages, I dialed down spending there and put it into the range tech. The two finished at around the same time, roughly around 2335. I still only had the two planets at this point; what a slow start! 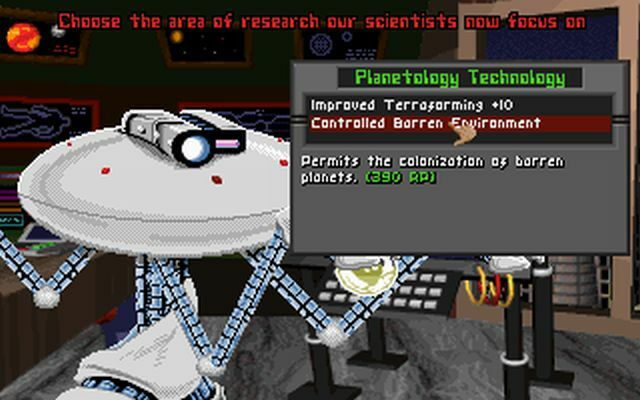 That's actually NOT a good thing, as it means I've been putting my production into research instead of colony ships. 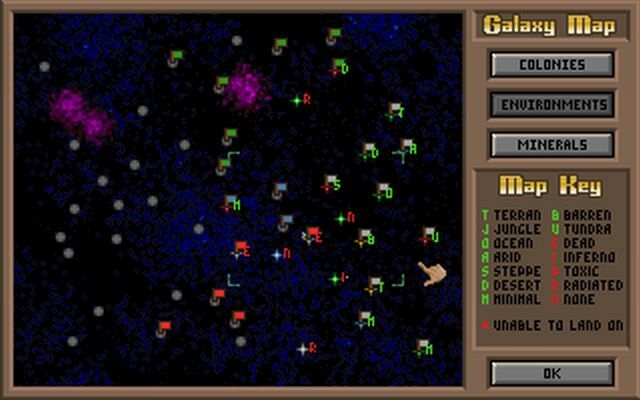 As it turns out, the Humans (listed last above) were plopping down lots of colonies, and would prove to be the most dangerous competition in this game. The good news is that the Klackons still have not made any headway to the east as yet, as you can see my scout blockades still holding up there. Kholdan was at the yellow star identified earlier, and their second planet was at the green star just south of it. 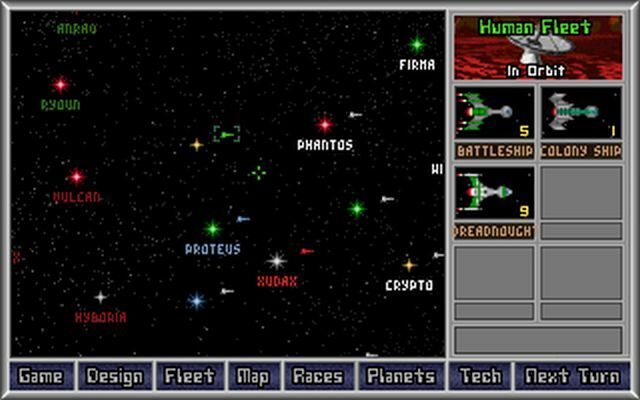 However, the blue star to the south and the white star to the southeast were both hostile, and they must not have had the range to settle the red star directly east of their homeworld. I still had a shot to get some planets up there! Settling Crypto greatly extended my range to the north, allowing my scouts to fan out further and scout more worlds. Just a turn or two later, I came across an Artifacts planet - free tech, and a biggie! I chased away a Klackon scout from that Artifacts world on the very next turn! Wow. I did NOT want the Propulsion-challenged bugs to have that tech, no sirree! Sometimes it really is better to be lucky than good. This laser fighter is indistinguishable from thousands of similar designs that I'm sure have been used in MOO for a decade now - EXCEPT that my freebie tech has allowed me to slap Sub-Light drives on it. Maneuverability of 3 this early, woohoo! 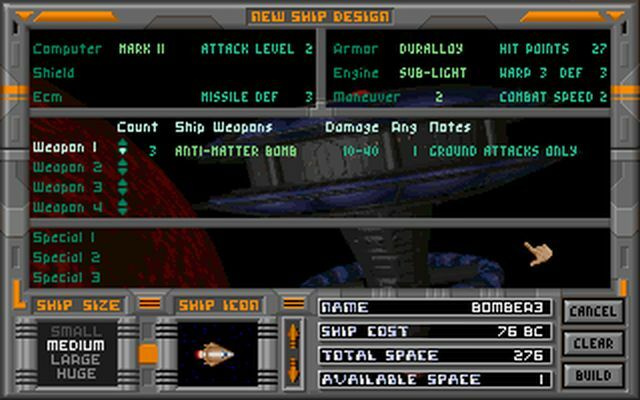 Meklon could build about ten of these per turn; I slipped in construction between colony ships until I had about 50 of them up in the north. 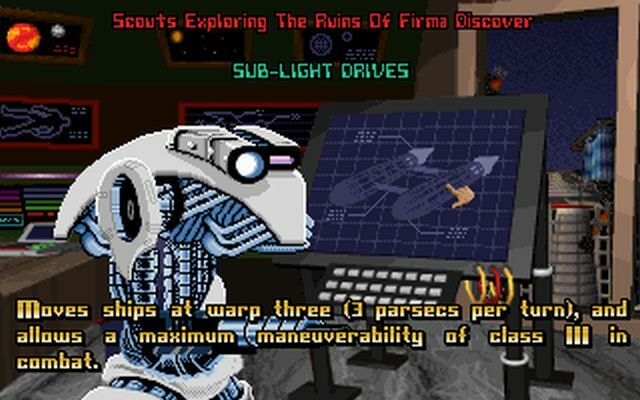 Sure they were cardboard cutouts, but they could chase away scouts and armed colony ships and buy me some time up there, which was the whole goal. 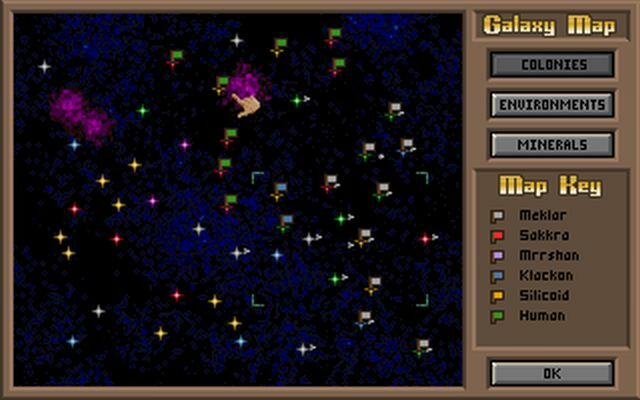 Having planets on point with NOTHING defending them is just an invitation for AI aggression. Due to their lack of range tech, the Klackons remain stuck with only two planets. They had a fleet that could easily wipe out my new colonies (assuming they could reach them, that is) so I signed the max trade agreement and hoped to stay on their good side here in the early going. 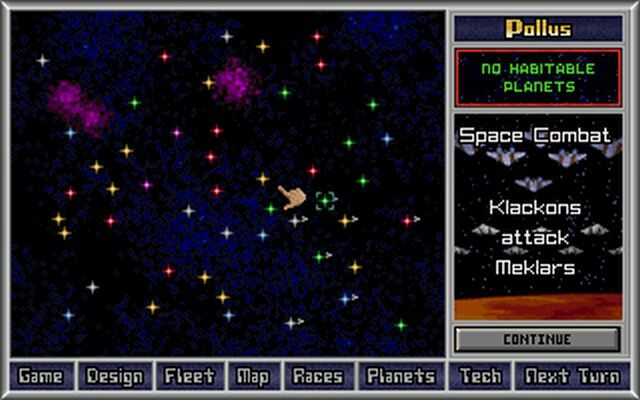 My planet of Phantos is the white flag in the northwest; unfortunately, the planet is Poor. Argh! Right next to the Klackon homeworld, no less. I stationed my laser fighters here while the planet began its long, slow factory buildup. It was a good source of population immigrants for other nearby planets, however. Size 90, excellent. 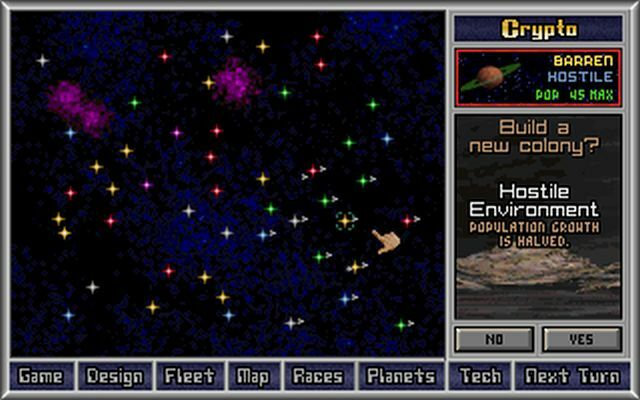 So after that horrible situation in the starting corner, there were no fewer than five habitable planets (five out of five!) in the territory just beyond the Barren world. 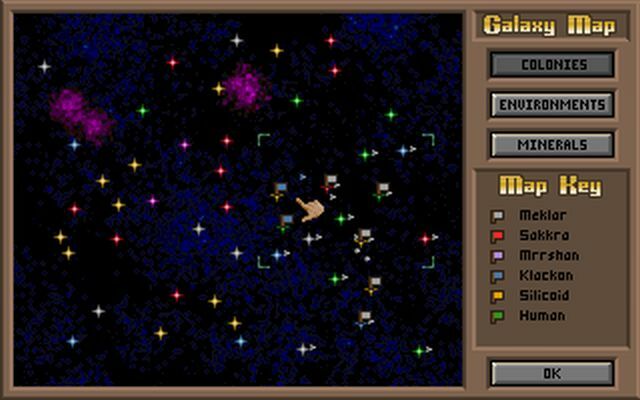 Thanks to my decisive action to break out of the starting position, I would manage to land all of them, giving me a nice core of nine planets (including the Minimal planet in the extreme southeast). Most of them were relatively small, but there is no such thing as a "small" empire of Meklar with all of those factories, hehe. When I settled Spica, I was introduced to the Humans, who began in the north. 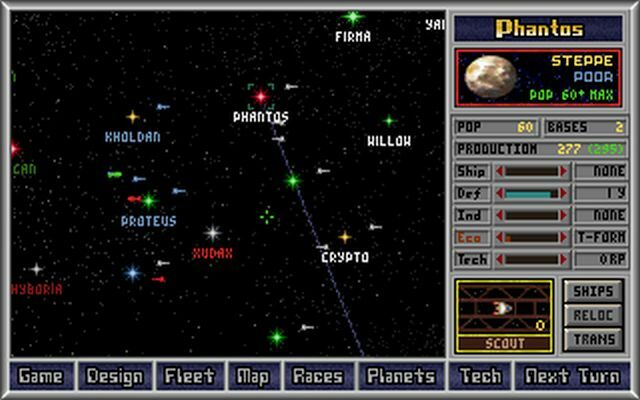 They had already managed to settle eight worlds themselves, and with flags in the center of the map, were sure to be in contact with virtually all races. Now that wouldn't be dire news for most races, but for the Humans? Uh oh. The danger of losing an early vote is practically off the charts against the diplo-happy apes. I was pretty sure I would be second in population (thus being their opponent), and remember - I can't even TALK to anyone else other than the Klackons, stuck here on the edge of the galaxy. I managed to survive this election, albeit barely. 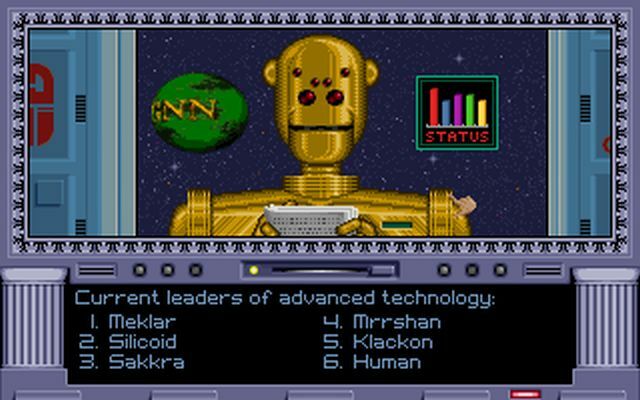 The Humans gained voted from the Mrrshans and Klackons, and came up only three votes short of winning. In fact, if the Sakkra had voted for the Humans instead of abstaining with their three votes, the game would have ended right here (Sakkra were not in contact with them at this point). My only support came from the rocks, as expected (I had only three votes myself, not enough to block much of anything). I realized I had better do something to turn things around, and fast, or else the Humans were going to win a very early Diplo victory! 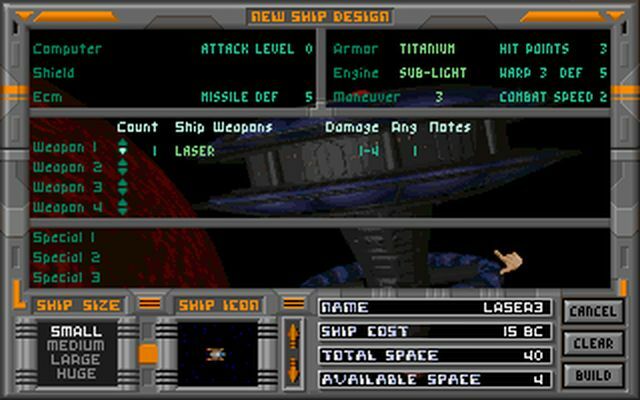 The cursor is pointing to Sol, the Human homeworld. My position looks stronger than it actually is here; sure, I have a lot of planets, but they are almost entirely brand new, fledgling colonies. What I really need is time, time to sit back in my little Meklar corner and build endless arrays of factories for use later on. I just had to make sure I didn't lose the game or get wiped out by an AI fleet while that was taking place. 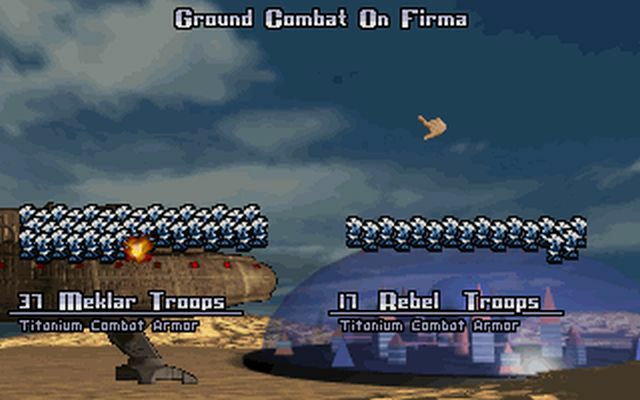 Of course, this is hardly what I need to be dealing with: Firma rebelled, and I had to send in the troops to get it back. Argh! Still early enough in the game that this seriously hurt the development of some of my colonies. And yes, that's two games in a row that my Artifacts planet has been hit with the Rebellion event! 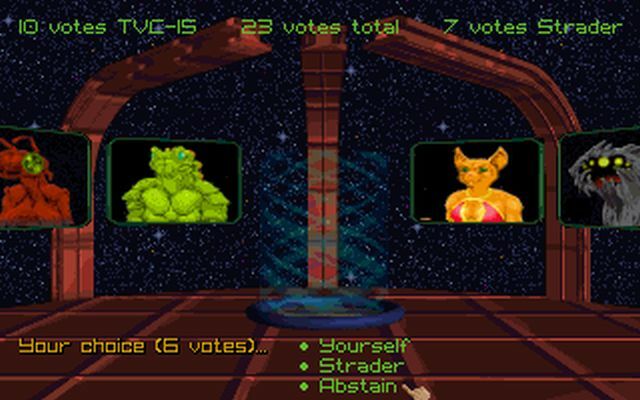 The Mrrshans had a strong alliance with the Humans and voted with them, but everyone else voted for me. Silicoids already hated the apes, but I had pulled the Klackons to my side with that war declaration, and then the bugs brought in the Sakkra against the Humans as well. Win there for the taking, just like that. Only... I didn't really feel as though I had deserved this victory. 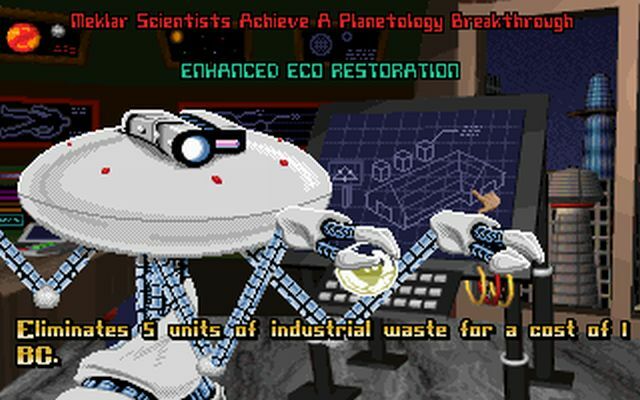 I mean, I didn't really DO anything beyond settle planets and build a bunch of factories. So... I abstained from the Diplo victory. I might have taken it if the Psilons were present, but they weren't, and so I played on in the hopes of achieving a more dominant victory down the road. Besides, I hadn't dished out any attacks yet, and where's the fun in retiring before doing some damage? Now I had been pretty isolated for the first hundred turns of the game, with only the Klackons as an immediate neighbor and the Humans a distant presence at the edge of my range. The Sakkra apparently learned some new Planetology tech (not surprising, that) and began settling the Dead environments on my borders. I let them have one in the west, but I resolved to fight their fleet in space for the other! 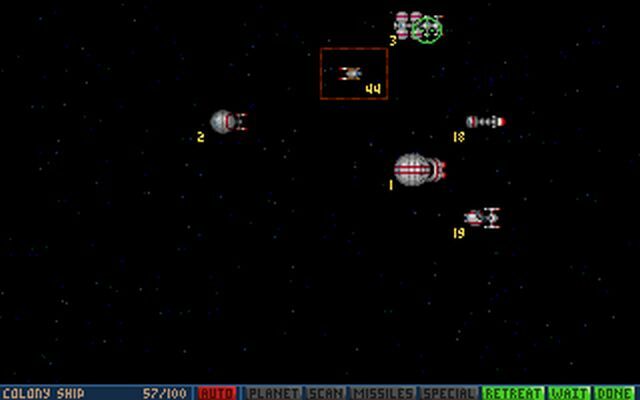 My laser fighters proved to be rather tough for their ships to hit, thanks to the extra maneuverability I had. I killed off two of their three colony ships and the last one retreated; then I managed to kill off most of the other ships there before having to retreat. 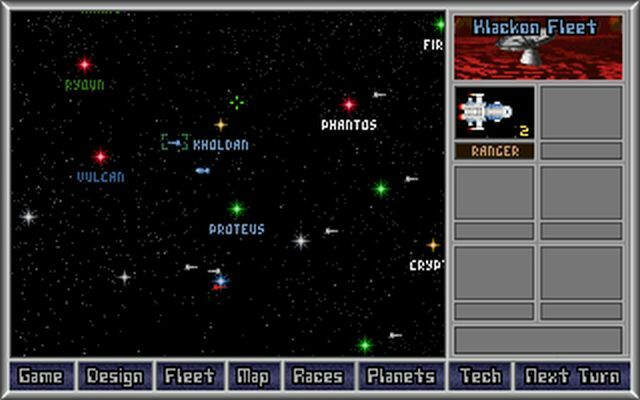 However, I evidently need to learn more about how the combat system works in MOO, because that gave the Sakkra control over the system, and allowed the colony ship that "retreated" to remain there and plant a colony! That was a surprise to me, let me tell you. Since I didn't exactly want to fight the Sakkra, I was forced to concede the planet to them and would not challenge their control further. They just had a better fleet than me, period, so I was in no position to push them around. I've grabbed the tundra planet in my backlines to get out to an even 10 planets, but now I'm stuck. Need more Planetology to be able to settle further. Fortunately, Controlled Radiated was in the tree, and there were two planets out in open space that I would be able to grab for use as forward bases with that tech. And with some of my worlds finally beginning to mature, in terms of both factories and base counts, I could begin doing some research in earnest now. 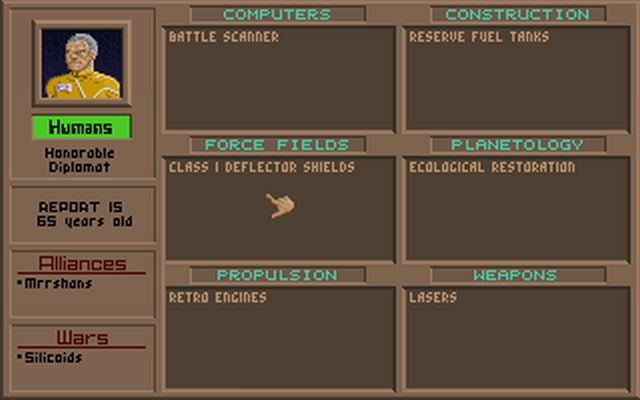 Still too early to do any fleetbuilding (although I replaced my laser fighters with ion ones once I discovered Ion Cannon, and built about 100 of them), but with tech beginning to come in, it wasn't that far off either. No initial waste cleanup techs, so this along with Reduced Waste 60% got me down into the acceptable region. And for the Meklar, cleaning up factory waste is a very big priority! A hit in all fields? Must be something good. I knew that the Humans had just developed some new weapons, and I had been looking for a gun upgrade. I decided to roll the dice on the Weapons category, knowing I had a 1/3 shot to pull something really good. Lady Luck was with me, and I grabbed the Humans' top weapon! Graviton Beam, excellent. A significant upgrade from the ion cannon I had been using. Too bad that no one was using fleets made up of Small ships (no Alkari in this galaxy), but it would still make for a pretty good weapon. 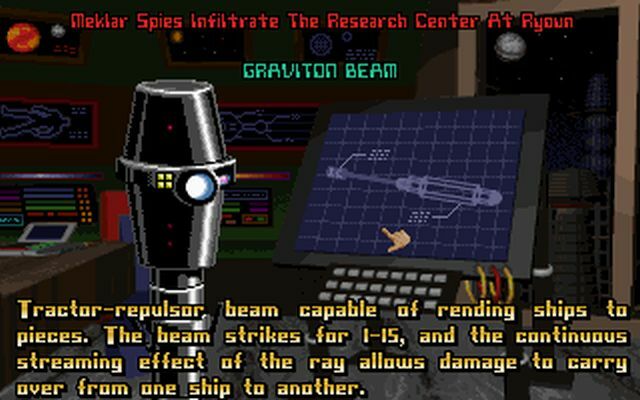 In fact, I would soon design a large ship using these Graviton Beams as the primary weapon. 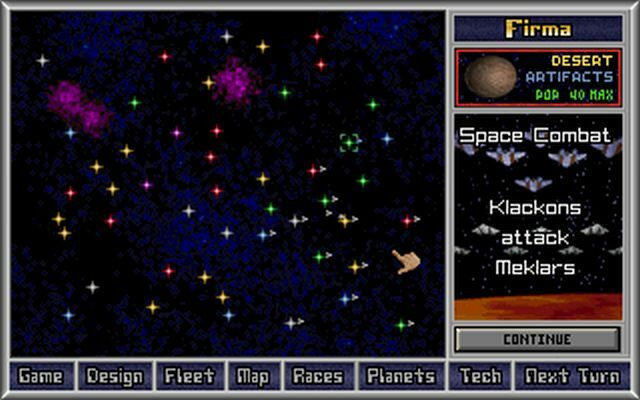 I wasn't quite ready to fight the Human fleet yet though. They had some powerful large ships moving around. In fact, they were so strong that they gained space superiority over Kholdan and bombed it out of existance! The bugs would fight them off and resettle it, but their backs had clearly been broken. 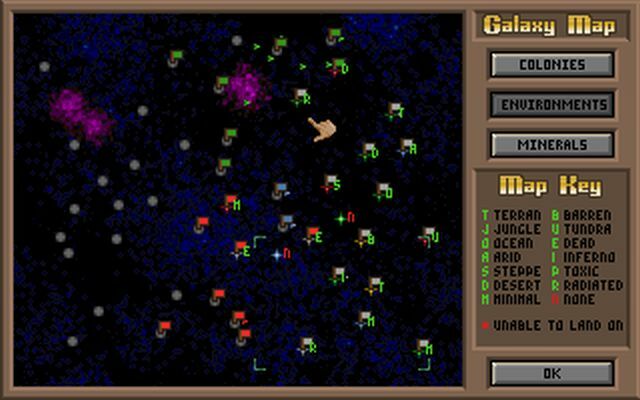 The Klackons were now an also-ran, frequently running some One Planet Empire action at Proteus to the south. And all from that war declaration that I triggered earlier. Thanks for taking the bullet, guys! Excellent bodyguard work protecting the Meklar corner from attack for so long. I had spent enough of the game building factories and bases; now it was time to go on the offensive for the first time.